Originally used as integral components of commercial grain management systems, the Titan flat bottom silos are now available in sizes ideal for use on farms. 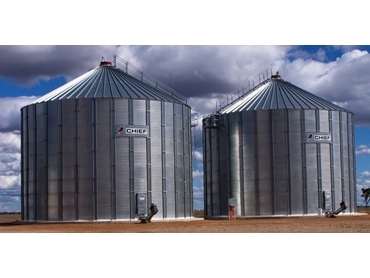 Offering all the features that have created the Titan reputation for strength, durability and ease of installation, these small flat bottom silos feature sidewalls created from high quality 20 through 8 gauge galvanized steel with tensile strength up to 65 ksi (448 mpa). strong resistance to lateral movement and uplift. The large 26" x 62" obstruction-free opening in these silos provides easy entry without fear of catching on brackets or hooks. A lockable outside cover secures the contents and protects against unauthorized entry. They Titan small flat bottom silos are available from MPH Rural in different diameters ranging from 15'6" (4.7 metres) to 34'0" (10.37 metres) and overall heights of 19' 2" (5.84 metres) to 82'3" (25.07 metres).